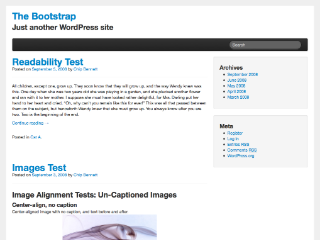 A WordPress Theme based on Bootstrap, from Twitter. It features a 100% responsive layout, a superb gallery and image handling with a custom image meta widget and carousel for gallery post-formats, the Glyphicon Icon set, a clean and simple design and a lot more! The Bootstrap runs on HTML5 and CSS3, a 12-column grid and comes with custom jQuery plugins. See the Bootstrap documentation on GitHub for reference.